2017 is off to a good start for me, at least in terms of books. I’m participating in Litsy’s A to Z challenge (I’m admittedly obsessed with Litsy after finally discovering all the cool things over there) and since I’m mildly compulsive with respect to the order of how I complete challenges, I started off the year with “A.” Thus, The Association of Small Bombs by Mahajan was my first selection of the year. 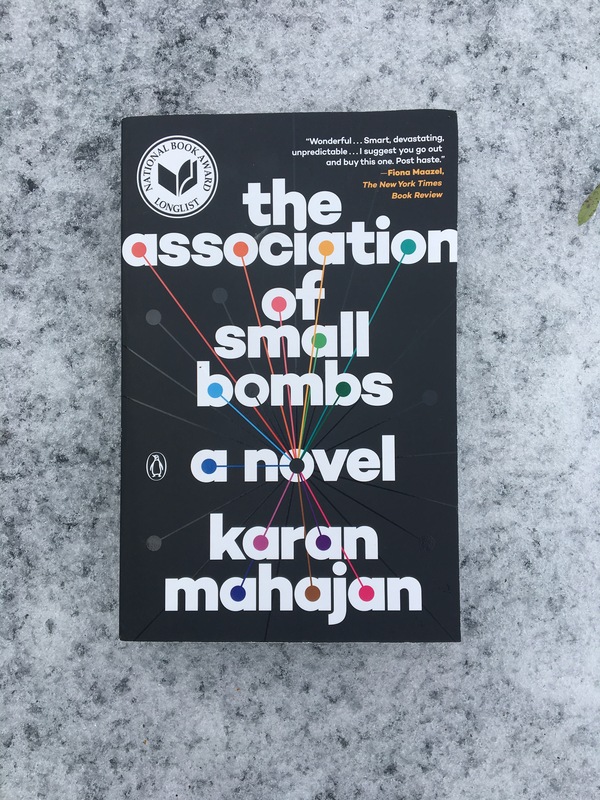 The Association of Small Bombs is novel about the threads and connections between victims and terrorists and it explores how individuals may shift in their roles between victim and perpetrator. It is a wonderfully clever, heartbreaking, and astute account of the aftermath of violence and tragedy. The novel begins with a small bomb in a Dehli market that kills a few dozen people including the Khurana’s 11 and 13 year-old sons — their only children. The story then follows the aftermath of the tragedy. What is clever and fairly gutsy about the book is that it is told from the perspective of multiple players impacted by the tragedy including the people responsible for the bomb. Most of us don’t want to feel sympathy for terrorists. It’s easier to see them as likely sociopaths who have no empathy or understanding of the value of human life. Mahajan doesn’t allow us this luxury. Instead he places the reader in a position of empathizing with the terrorist. We can hate what they did, and the misery they caused, but we also start to see how certain people may be driven to commit atrocious acts as a result of a number social, personal, and environmental factors. The author doesn’t excuse or condone the use of violence. In fact, to a large extent any kind of judgment about good/evil is missing from the narrative. He leaves it up to us to make our own judgment about the characters and their actions and that is part of the genius of this novel. As many of you know, I am a psychologist in my professional life. Every year I attend professional conferences and several years ago I attended a lecture on terrorism by one of the leading psychological experts in the field, Dr. Arie Kruglanski. I don’t personally specialize in working with patients who commit violence against others, but I found the subject matter interesting therefore attended the lecture on a whim. The researcher had spent years with his team interviewing members of some of the worst terrorists organizations in the world, going into jails and into terrifying places to find these people. In doing his research he found commonalities in what drove people into viewing violence as the ultimate solution. He discussed how various types of loss (loss of loved ones, of homes, etc.) combined with a complete sense of powerlessness drives many into terrorism. Of course his argument was more complex than that (he also discussed the ways in which we can intervene to change this process), but it made me think about how astutely the author of this novel captured what this terrorism expert discussed in his research talk. Mahajan accurately captured the pathways into terrorism that are discussed in academic literature. At its heart, The Association of Small Bombs is really about terrorism but about how individuals cope with, and are changed by their exposure, to traumatic events. Many links in this book are circular with connections that spread out in many directions but ultimately return to the starting point. It’s a clever book, with a clever title, and strong writing. I highly recommend it to you. Want to try it for yourself? You can purchase your copy here: The Association of Small Bombs. We want to hear from you! Have you read this book? What did you think? Is it a book that sounds good to you? Why or why not? This was already on my TBR, so I’m glad to hear you speak of it so favorably. The fact that you found it realistic based on your professional knowledge makes me even more interested to read it. I enjoyed this one, too. It was on the National Book Award shortlist, and if Underground Railroad hadn’t been on the list, too, I think it could have taken it. It is certainly a book that made me think, and there are so many who could benefit from reading it. If only they would.